Susan J. Lupinacci, 67, a lifelong Huntington Station resident and mother of Huntington Supervisor Chad Lupinacci, died on Tuesday, Jan. 15 in her home on 11th Avenue, Supervisor Lupinacci said in a statement released last Wednesday. “She was a compassionate person who instilled the importance of helping others in me and my entire family and her absence from our lives is an immeasurable loss. I am so fortunate to have had a mother who loved me unconditionally and supported me wholeheartedly in my many endeavors. I will cherish the countless memories that we shared, and never forget the pride she had when I took the oath of office as Huntington Town Supervisor at our alma mater, Walt Whitman High School. I want to thank everyone for their thoughts and prayers of support and healing during this painful time,” Lupinacci said. Susan Lupinacci was born on Dec, 1, 1951 to Joseph and Ann Di Spirito. She grew up on 7th Avenue North in Huntington Station with her brother and sisters, graduating from Walt Whitman High School with the Class of 1969. Her family owned Di Spirito Meat Market, the prominent pre-Urban Renewal Huntington Station butcher shop on New York Avenue, which was later relocated and renamed Whitman Meats. Lupinacci had a career as a professional gardener and caterer and moved just four blocks from her childhood home to reside at 11th Avenue with her husband Sal Lupinacci for more than 40 years. In addition to her husband and son, she is survived by a daughter Allison Belfiore, brother Edward Di Spirito, sisters Dolores Kenny and Connie Di Spirito, two grandchildren and many nieces, nephews, and cousins. The family will receive friends at M.A. Connell Funeral Home Monday, Jan. 21. Funeral services will be held at 10:45 a.m. on Tuesday, Jan. 22, at St. Hugh of Lincoln R.C. Church in Huntington Station. Burial will follow at St. Patrick’s Cemetery, Huntington. Congressman Thomas Suozzi works during a hearing of the House Committee on Ways and Means. Huntington’s second-term congressman Thomas Suozzi has been named to the House of Representatives’ Ways and Means Committee. Suozzi (D-Glen Cove) thanked House Democratic leadership and the new Ways and Means Committee chair Richard Neal (D- Worcester, MA) for appointing him to the prestigious committee. The Committee on Ways and Means is the oldest committee of the United States Congress, and is the chief tax-writing committee in the House of Representatives. The committee has jurisdiction over revenue and related issues such as tariffs, trade agreements, Social Security, Medicare and other social services programs. Suozzi said his experience as a former CPA, an attorney, Mayor of Glen Cove and Nassau County Executive would help bring expertise to the committee charged with handling revenue and tax legislation. Suozzi is slated to take over the “downstate New York seat” on the committee previously held by former Democratic congressman Joe Crowley. Crowley lost the 2018 Democratic primary for New York’s 14th District in Queens to Alexandria Ocasio-Cortez. Suozzi is one of 10 new Democratic members appointed to the Ways and Means Committee since the Democrats took control of the House on Jan. 3. Three alleged members of the MS-13 street gang arrested Wednesday after a teen was stabbed at the Big H shopping center in Huntington entered the country illegally, according to Suffolk District Attorney Tim Sini. At a press conference Thursday afternoon Sini detailed the incident that sent a 16-year-old Huntington High School student to the hospital and left at least one other teen injured. Police were called to the Burger King in the Big H shopping center at 837 New York Avenue at 3:38 p.m. on Jan. 9 where a fight had broken out between two groups, Sini said. The alleged MS-13 members – Nobeli Montes Zuniga, 20, Ramon Arevalo Lopez, 19, and Oscar Canales Molina, 17, all of Huntington Station – “charged after the teens while wielding bats and knives, and an altercation broke out,” Sini said. During the ensuing “melee,” Sini said Lopez stabbed the 16-year-old. The stabbing victim was taken from the scene to Good Samaritan Hospital Medical Center in West Islip for treatment of non-life-threatening injuries. Sini said another teen was also injured in the incident. The three suspects took off in a Toyota, and were arrested in the vehicle a short time later “with blood on their clothing and hands,” Sini said. Zuniga, Lopez and Molina are all “confirmed” members of the MS 13 gang, and all entered the country illegally,Sini said. • The alleged stabber, Lopez, entered the country illegally on Dec. 8, 2016 and was picked up by the Department of Homeland Security in October 2017. A federal judge released him from custody in June 2018. • Molina entered the country as an unaccompanied minor. He was picked up by Homeland Security in July 2017 and released by a federal judge on November 28 of that year. • Zuniga entered the country as an unaccompanied minor. There was increased security at Huntington High School Thursday. In a letter posted to the district website Wednesday night, Huntington Superintendent James Polansky said high school staff was aware of the incident. “So as to take every precaution possible, additional security measures will be in place at the school tomorrow morning and a police presence has been requested,” Polansky said in the letter. Suffolk Police Commissioner Geraldine Hart confirmed police acted on Polansky’s request and had officers at the high school Thursday during lunchtime and at dismissal. She said Thursday afternoon no incidents had occurred at the school. Zuniga, Lopez and Molina were all charged with second-degree assault. They were arraigned at First District Court in Central Islip on Jan. 10. Lopez’s bail was set at $35,000, according to Sini. It was a show of power from state Democratic politicians at the John W. Engeman Theater in Northport Sunday for the swearing-in ceremony of recently elected State Senator Jim Gaughran. 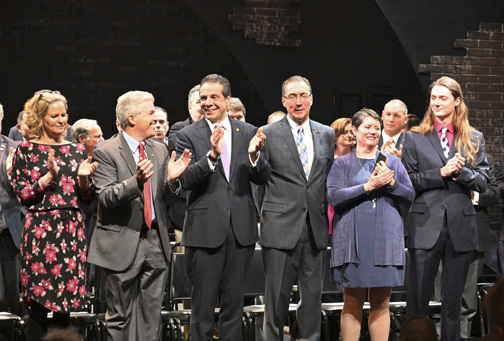 Governor Andrew Cuomo made the trip from Albany to lead Gaughran in the oath of office in front of a full house of enthusiastic supports. Gaughran’s wife Carol and son Michael were also on hand to witness the ceremony. Gaughran’s defeat of veteran Republican State Senator Carl Marcellino in the 5th State Senate District in November was a significant victory for New York Democrats. Senate Democrats picked up eight seats and enter 2019 with a 39-24 majority. As state lawmakers return to Albany this week for the start of the new legislative session, Democrats now control the governor’s office and both houses of the legislature. Issues Gaughran said he hoped to tackle during his term included criminal justice and ethics reform, healthcare, the Long Island Rail Road, environmental issues and gun safety reform. A who’s who of Democratic power players flanking Gaughran on stage for the ceremony also included Senator Chuck Schumer, Suffolk County Executive Steve Bellone, Nassau County Executive Laura Curran and Assemblyman Charles Lavine (D- Glenn Cove) who served as master of ceremony. Schumer said Gaughran “earned” his senate seat on a record of ethics reform while serving on the Huntington town board and Suffolk County legislature. “Some people are just born dedicated to public service, and that’s Jim Gaughran,” Schumer said. Bellone also highlighted Gaughran’s leadership experience at the local level. 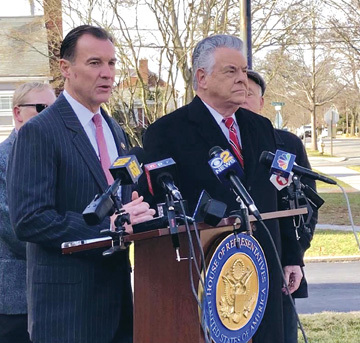 Long Island Congressmen Thomas Suozzi (D- Glen Cove) and Peter King (R- Seaford) have introduced legislation to restore the full State and Local Tax (SALT) deduction capped by the Tax Cuts and Jobs Act of 2017. The King-Suozzi bill, introduced Friday as the 116th Congress began work, would repeal the $10,000 cap on SALT deductions and retroactively restore a full deduction. Both King and Suozzi said the $10,000 cap has a disproportionately negative impact on middle-class families in areas with high taxes like Long Island, and both voted against the Tax Cuts and Jobs Act of 2017. “Eliminating deductions for local and state taxes will have a devastating effect on Long Island,” King said at a press conference Monday. King said Long Islanders “already give far more to Washington then we get back,” getting 79 cents back from every tax dollar paid to the federal government. “That’s a $48 billion shortfall and hurts our middle class,” King said. Suozzi called the 2017 tax bill a “punch in the gut” for Long Islanders. In Suozzi’s 3rd Congressional District, which includes all of the Town of Huntington, 250,000 families, or 43 percent of households, claim the SALT deduction at an average rate of $18,300, Suozzi said. “We pay very high taxes, and we’ve always relied on the deduction,” Suozzi said. In order to reach a vote on the floor of the Democratic-controlled House, Suozzi said the King-Suozzi bill must first pass through the House Ways and Means Committee. The Republican-controlled Senate must also approve the bill, where Suozzi said he anticipates a much tougher battle to get enough votes. Suozzi said “most New York Democrats and Republicans will support us in this,” but urged Long Islander to continue to “make this [SALT deductions] an issue” with their federal representatives. Political newcomer Michael Bento announced his candidacy for a town board seat in the Nov. 2019 election. Northport resident Michael Bento got his first political campaign off to an early start last week when he announced his candidacy for Huntington Town Board. Bento, 30, a Democrat, said he is looking to bring a “fresh, young voice” to the town board. The pair of town board seats up for election in 2019 are currently held by Democrat Councilwoman Joan Cergol and Councilman Eugene Cook, an Independence Party member who last election also ran on the Republican ticket. “I found the seawall is symbolic of the overall crumbling infrastructure townwide,” Bento said in an interview Tuesday. Bento earned his master’s degree in history from Queens College, and has previously worked as a constant for investment baking operations. He worked on six Democratic campaigns during the 2018 election cycle, and was elected last year to the Suffolk County Democratic Committee. In addition to infrastructure upgrades, Bento said ethics reforms were needed at town hall. He also advocated the town restructure its process for awarding contracts to private companies. “I think we need a more open and transparent bidding process for those contacts, and we need to find out which of them are not a necessity to the town,” Bento said. As a Northport resident, Bento said he is aware of the potential impacts of LIPA’s tax challenge of the Northport Power Plant. He argued the town should “mandate LIPA goes back to the original agreement of being a productive member of the community,” including restoration of nearby beaches. Cergol will run for a new four-year term in November, and a spokesman said she plans to formally announce her campaign for town council later in the year. Cergol has served on the town board since December 2017, when she was appointed to the seat left vacant by Susan Berland’s resignation. Cergol won election last year to serve out the remaining year of Berland’s term. Cook, who was first elected in 2011, said he hasn’t yet decided if he will run for a third term on the town board, and encouraged residents to let him know their opinions. Deputy Supervisor Patricia DelCol’s last day on the job will be Jan. 29. Longtime Deputy Supervisor Patricia DelCol is set to resign her position with the town at the end of the month. The veteran town employee said she would be moving to a position in the private sector with Melville-based architecture and engineering firm H2M. Lupinacci has not named any candidates to replace DelCol as deputy supervisor. DelCol began her career with the town in 1986 as director of environmental control. After a spell in the private sector with Covanta Energy, she was again hired by the town in 2005 as the director of engineering services. In her tenure as deputy supervisor, DelCol said the town’s “sound financial footing” and capital projects rank among her proudest accomplishments. She said the job of the deputy supervisor is “day-to-day management” of town projects and departments. “Someone once told me the job of this position is to ‘keep the trains running on time,’ and that is very true,” DelCol said. She said her time at town hall has been rewarding. Councilman Mark Cuthbertson, who has served on the town board since 1998, called DelCol a “significant player at town hall” who “is very integral” to the town’s day-to-day operations. “She understands all the town’s facets – finance, waste management, building department – she has a really acute understanding of all those areas,” Cuthbertson said. DelCol said her last day at town hall will be Jan. 29. A raging blaze at a condominium complex in Melville damaged four units two days after Christmas, fire officials said. Melville firefighters responded to reports of a fire at The Greens on Adriatic Drive just after 4 p.m., Dec. 27, according to fire officials. Fire crews arrived to find the blaze raging out of the first and second stories of two condos in the 16-unit building. Melville firefighter began an aggressive attack on the fire and had it under control in about 40 minutes, fire officials said. Fire officials said all of the residents were safely out of the condos, and no injuries were reported. Two condos sustained heavy fire damage, and two others sustained water and smoke damage, according to fire officials. Melville fire chief Chris Nolan and first assistant chief David Kaplan commanded 75 firefighters who battled the blaze. Firefighters from Dix Hills, Huntington Manor, Plainview, East Farmingdale, Farmingdale and Wyandanch helped fight the blaze. Fire officials said the Suffolk Police Arson Squad and Huntington Town Fire Marshal are investigating the cause of the fire. Suffolk police arrested a Greenlawn woman Tuesday who they say stole a purse during Christmas Eve mass at St. Francis of Assisi Roman Catholic Church. Tara Costello, 45, and her partner Michael Cuozzo, 51, also of Greenlawn, have been charged with stealing multiple credit cards during a three-day span last week, according to Suffolk police. Police arrested Costello and Cuozzo, who was not charged in connection with the theft from the church, at their home on Broadway in Greenlawn at around noon on New Year’s Day, police said. The couple was charged with fourth-degree grand larceny for allegedly stealing purses or wallets containing credit cards from Blackstone Steakhouse in Melville and McKeown’s Pub in Huntington on Dec. 23, and from Jenny Craig in Huntington Station on Dec. 26, according to police. Police additionally charged Costello for allegedly stealing the purse of a parishioner at St. Francis in Greenlawn during mass on Dec. 24. She was also charged with four counts of fourth-degree criminal procession of stolen property for using the stolen credit cards, police said. Security footage from the church shows a pair of women stealing a purse from a pew as parishioners left their seats to receive Communion at the alter. Suffolk police said no other suspects were arrested in connection with the church theft. Suffolk police said Costello and Cuozzo were released on bail and will be arraigned at a later date. Single-stream recycling went out the window for the town’s four villages on Jan. 2, returning residents to days when they were required to sort and keep track of which recyclables get put out on the curb each week. All four incorporated villages followed the Town of Huntington in requiring residents to divide their recyclables based on the material, either paper, plastic and metals, or glass. Recycling days will remain on Wednesdays, but each week the recyclable materials being picked up with alternate. Each village has their schedule and quirks, but ultimately each is going through the same procedure. “I think that everyone who is interested in recycling is perfectly happy to do it either way, since they’re environmentally motivated enough to recycle,” Asharoken mayor, Greg Letica said. The change comes after an agreement between the towns of Huntington and Brookhaven that sent mixed recyclables to Brookhaven for processing was abrputly ended in October. Town officials found switching back to dual-stream recycling was more cost effective. Continuing with mixed recycables would coast an estimated $950,000 annually, while seperated recycables can be processed at about $250,000 annually, Huntington’s environmental waste management director John Clark told town officals in November. “At this point, dual-stream is more cost-effective, single-stream would cost the residents an extra $95 a ton to get rid of,” Northport village administrator, Tim Brojer said. Asharoken implemented a soft transition for the procedure by starting dual-stream sorting on Dec. 12, weeks before the change went into effect. They require residents to separate into three bins: bin #1 is clean, unsoiled paper products, excluding styrofoam, bin #2 is rinsed clean cans and plastic, and bin #3 is clean glass bottles and containers. The separation allows materials to be better manipulated for reuse, something Letica said produces a better environmental outcome. “Recycling is a critical component of making our environment better, it reduces trash and reduces the amount of energy needed to create these products,” Letica said. Letica said Asharoken residents should set out plastic and glass on Jan. 9, and paper on Jan. 16. From there, the weeks will alternate. The villages of Asharoken and Lloyd Harbor have an intermunicipal agreement with the Town of Smithtown to process dual-stream recyclables. Huntington Bay kicked off dual-stream on Jan. 2, utilizing Winter Brothers for their trash and recycling needs. The Village will only recycle paper, plastic, and cans, glass will go in the normal trash flow. On Jan. 9, the town will recycle paper, then Jan. 16 plastic and cans, and so on. “I do believe recycling is an important activity, anything that makes recycling easier or encourages people, is a good thing… Now that there’s a calendar, it does make it a little more cumbersome but I hope that doesn’t discourage people from recycling,” Huntington Bay mayor Herbert Morrow said. Lloyd Harbor’s recycling changes went into effect on Jan. 1. Clean paper products must be separated from metals and plastics. No wax-coated containers, food-stained paper or cardboard, or glass can be put in the recyclables, according to information on the Village website. Lloyd Harbor has divided the Village based on location for recycling pick up. All homes on mainland South of and including Banbury Lane, can put their recycling to the curb Jan. 16 and 30, every other week. All homes on mainland North of Banbury Lane and on Lloyd Neck, will have their recyclables picked up Jan. 9 and 23. The Village of Northport has enlisted Total Collection to pick up their recyclables, and will follow the trend of separating paper from cans, plastic and glass. On Jan. 9, they will collect cans, plastic and glass, then on Jan. 16, they will accept paper, and so on.